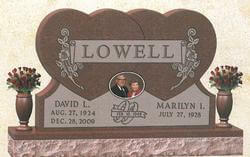 We can assist you to create a unique memorial as a permanent tribute to your family member. After you select the design and provide pertinent information, we will provide a picture proof with cost for your review and approval. Additional fees such as sales tax, cemetery and installation cost will be added. 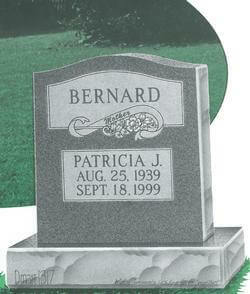 Standard grey granite monuments are usually available within 4 to 6 weeks. Certain sizes, designs and colors require additional delivery time. 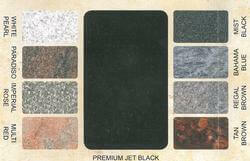 Flat grey granite: 12 x 24 x 6; most economical marker. One line inscriptions and different designs such as praying hands, roses, cross are available. The beveled monument is slightly raised for better visibility and easier to be located within the cemetery. The slant style is the first option for an upright monument. The slant on a base with a vase is the most popular style. It provides a raised foundation (base), higher sight visibility and a convenient vase to hold flowers for birthdays, anniversaries and holidays. The grey granite, square upright on a base is the traditional style monument. It is now available in a variety of colors and different shapes. Memorial benches provide a different method of permanent tribute. 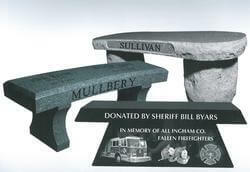 The benches may be placed at the cemetery or home where family members can sit and reflect on pleasant memories. Monuments are now available in a variety of colors to reflect personal style, uniqueness and contemporary design. Our solar lights are low maintenance, energy efficient and made from 100% granite. The battery charges by day and powers the included LED light by night. A built in sensor will power off the light automatically. You can also use the switch within the unit to turn the light on and off as you desire. 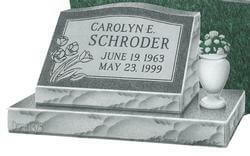 Granite vases provide a permanent location for floral arrangements to be placed easily and conveniently at the grave. Being up off the ground and adjacent to the monument presents a prettier picture and helps in the maintenance of the cemetery.